Experimental liturgical music written during a time period in the songwriter's life when he was studying theology. The songs feature a series of singers involved in music ministry in the San Francisco Bay Area. In 2008, I enrolled at the Jesuit School of Theology at Berkeley (now the Jesuit School of Theology of Santa Clara University at Berkeley). I served as the community’s liturgical music coordinator, applying the concepts I was learning in my Liturgical Studies master’s degree program. Every Tuesday evening at 5:15, you would find me at the piano helping lead the community in worship. At first, it was nerve-racking to have professors, lecturers, and fellow theologians sitting in the assembly. But it was the perfect place to experiment with creating liturgical music. This was the campus where the Saint Louis Jesuits convened in 1974 to write the songs that would become a regular part of the worship life of the Catholic Church in the United States. And the San Francisco Bay Area is home to some of the Church’s most beloved contemporary liturgical composers, including Janet Sullivan Whitaker, Bob Hurd, Ricky Manalo, Jesse Manibusan, and Dan Schutte. Though I don’t consider myself among those greats, I was eager to share my music with the community’s professors, lecturers, and theologians. I am an experimental composer. While I aim for the the “full, active, and conscious participation” of the faithful in worship, I am also interested in pushing boundaries. I have an affinity for the diversity of expression in liturgical music, and I feel that liturgical composers have a prophetic calling to hint at the possibilities of how the world could be. In my work, I try to “make new what once was old,” showing that there is wisdom in looking back in order to move forward. 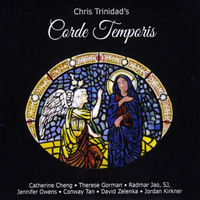 Many of these compositions make liberal use of Gregorian chant melodies set in a contemporary style. I understand that not all of the music in this collection may be suitable for any particular worshipping assembly. That is alright by me. I am content to let the music stand for itself. If any of it is appropriate for your worship, that’s a wonderful bonus. I recorded this collection between January 2015 and June 2017. I had fun experimenting with an array of sounds using piano, synthesizers, fretless bass guitar, percussion, Filipino indigenous and traditional instruments, samples, and even morse code! I aimed to document the compositions from this unique time, to bring together colleagues in ministry, and to share the music with other communities.